IxChel! I first heard about this goddess in 1994 when the book Sastun, by Dr. Rosita Arvigo, floated into my life. I read the book in one sitting, in one night. Being of Belizean heritage, this story of an American woman who lived in the jungles of Belize, studying herbs with one of the last known Mayan shaman healers of the region, had me absolutely intrigued and awakened. Within six weeks of reading this true account of Dr. Rosita and Don Elijio Panti’s life, I was packed and moving to Belize. Little did I know, at the time, the Goddess had beckoned. I had a wild idea… and the Fool/Maiden (Tarot Card 0) set that journey in motion. I found myself in a canoe on the Macal River in Belize, with a Mayan man, being rowed six miles upriver to Ixchel Farm, home and workplace of Dr. Rosita Arvigo. Although I had the moxy to get myself to her doorstep, I didn’t quite have the self esteem to pronounce that I wanted to be her next apprentice. Whatever did stumble out of my mouth, I’ll never quite forget her reply. She told me I was unseasoned for work in the jungle, that I was a young girl who needed some life experience. She told me to go have a baby. Well, since she was my absolute heroine for the moment. I took her advice seriously, and quite literally. Without a husband, man or prospect of any mate, I decided it was time to have a child. Quite honestly, a strong biological urge had been nagging me to do just this. So without further ado, the next man who showed interest was my prey. Hence, began my journey into motherhood. I was living on a three mile island, Caye Caulker, Belize and had been forbidden by the local health officials to deliver my first child at home, seeing as how there was no doctor, not to mention a hospital, on the island. I do believe this is where my true relationship with Ixchel, a fellow Caribbean islander, Goddess of fertility, childbirth, healing & herbs, rainbow, the moon and all female issues, began in earnest. I called Dr. Rosita to ask for her advice in locating a midwife. I was determined to stay at home, like my Belizean grandmother before me, who had all twelve kids in the family home. Dr. Rosita referred me to one of her main herbal teachers and ally’s in Belize; the lovely, kind Hortence Robinson, who could neither read or write, but had delivered over 2000 babies in her career as a midwife. Needless to say, all went very well and my first son Angel entered the world, not quite as we all planned, but safe and sound, on a wooden terrace in the tropics, with his Papa, my black cat Eclipse and the seagrape tree as witnesses. Hortence arrived shortly post delivery, but just in time to facilitate my after-care, which is where I began to experience firsthand Belize’s deep & rich history with massage, abdominal care, vaginal steams and herbs; all treatments over which Ixchel definitely presides. True to my lot in life, ever keen to take on more than I can manage, I went on to have five lovely children as the Empress (Tarot Card 3) walked hand in hand with me for many years. Each and every child was delivered at home, three, in the conscientious care of indigenous midwives, and two, mysteriously, of my own accord. Again, this is where Ixchel guided and led me through these deep rites of passage & initiations to womanhood. I’m gonna be honest, nothing is going to make you feel stronger than delivering your own babies. (please note: I’m not recommending anyone to run out and do anything quite so steeped in the unknown). Living in Meso-America will keep you right in the arms of Ixchel and once you have called upon her, be prepared to meet her in all her aspects. She can be depicted as a beautiful Maiden holding onto her rabbit, bringing fertility, abundance and all the hope of youth. She can be depicted as the caring Mother weaving the dreams of her life and the universe, working with the healing herbs, and offering her good medicine. She can also be depicted as the Crone, the cosmic midwife and the destroyer, accompanied by the transformational snake on her head, wearing crossbones on her skirt and pouring out a water jug onto the Earth that may bring floods and rainstorms of destruction. I came to know her in every aspect she choose to appear. As the Maiden she gifted me with endless fertility. As the Mother, she offered me multiple webs to weave in which to care for my family. As the Crone, she came to teach me about death, decay and tragic loss. Shockingly, my fourth child and only daughter died (Tarot Card 13) on the island, at age two, of dysenterry. My tropical dream was no longer so magical. The path I walked, no-one coveted. Ergo, Ix-Chel could not remain my most venerated Deity. She was a force with whom to be reckoned. I had to blame someone. I blamed God/dess. I was a grief-stricken mother whose spiritual path had failed her, a woman with no religion, a born-again atheist. I relocated back to the USA to a small town, Ashland, Oregon (Tarot Card 16, the Tower). I was driving one day with my friend, shortly after arriving, a huge double rainbow extended itself from one side of our 4 mile by 4 mile town, to the other. It was so magnificent, we stopped the car to admire the width and breath and beauty of these rainbows (the picture below does not do the rainbow proper justice). Although my friend could not possibly know the context of this appearance, I knew this was IxChel, The Lady Rainbow herself, communicating that she was indeed with me, that she had actually never forsaken me, and that I was to carry her with me to this new land. The Goddess diaspora is real. Atheism is terribly lonely. I surrendered to the spiritual journey once again and began my small practice of spiritual healing with a few humble offerings, but with IxChel always at my side as my patron guide & goddess. It took six years in Ashland to come alive and heed her call to return to Belize to work with Dr. Rosita Arvigo in earnest. Thus, I arrived at IxChel Farm, 24 years after my initial pilgrimage, this time by road & vehicle, carrying 24 pounds of rose quartz for my daughters grave, and enrolled as a student to participate in a Mayan spiritual healing course being offered to learn the art of spiritual bathing. A dream realized. Some things take time. I needed each and every one of the multiple herbal flower baths we took through these trainings. Layers upon layers of memories and grief were released into the land of Belize at IxChel Farm. I came to realize that due to Dr. Rosita’s life path and story, she had brought me numerous gifts: she lured me back to my homeland where I could establish real roots in sweet Belize, she gifted me the omnipotent IxChel, she encouraged me to get on with my life as a mother, she guides me in healing with the plants and herbs of Belize, but most importantly, she opened the door for me to find my true life calling and purpose (Tarot Card 21, the World). As I approach menopause and the crone phase of life, I am busy researching a trip to Isla de Mujeres, the Island of Women, in Mexico which was IxChel’s original home. I am spiritually preparing for this epic ceremonial pilgrimage to Her power place. Historically women travelled to island three times in their life, to consecrate their menstruation, to pray for fertility & safe passage with childbirth and to bring offerings at menopause. I am gathering up my gifts: jade, clay statues, cocoa beans, turquoise, and hand woven objects; and planning, as well as anyone can plan for such a journey. Lady Rainbow has looked after me and it is soon time to pay homage to this mysterious Goddess of the Moon (Tarot Card, 17). around the southern point of the island. I prayed and sang in procession. in the Temple of Ix Chelab Yax. all for Her, the Fecund Mother. to me, her elder descendant. for Daughter IxChel, for Mama Tonantzin. where I return to honor Her. Ask, Ixchel demands. And so, again, I do. and let me trust in Love. and may I learn to receive it. grant that I and the world be done with blaming. free and whole in love. Hiking a short forested trail with my dog on the foothills of Ashland, Oregon, I come to a soothing assortment of Standing Stones. Here I sit at the base of a Grandmother Madrone tree with a panoramic view to this picturesque mountain town I call home. At some time in the life span of this Madrone, she has been struck by lightning. I love the energy she holds from the fire that must have ensued. Some of her branches are charred, burnt and dead, but mostly, her branches are gorgeously rejuvenated and continue to grow in a myriad of directions. She is currently loaded with berries, she stands atop this mountainside, a glorious specimen, a true testament to the resilience of Mother Nature. I was drawn to this place to make an essence. I open my 1 ounce dropper essence bottle filled with Icelandic artesian vodka and Mt. Shasta spring water, both ingredients hold importance. I am deeply aware of the current struggle for fresh water being led by the woman in North Dakota and of the woman in Iceland who seem to be standing strong in their fight for equal rights. 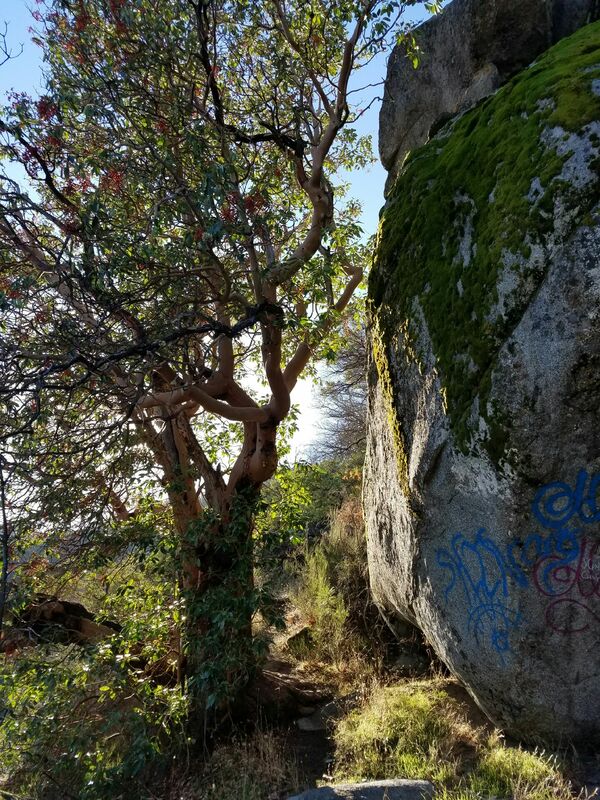 I call out to Grandmother Madrone, “Come bless my essence with your energy, I call forth the energies of a woman, struck by force, who wills her own rejuvenation, so that she may bloom again”. I named this essence, the ‘Grandmothers Speak’… through thunder and lightning… of the end of the patriarchy, of the healing of the woman. It is rejuvenation energy medicine. This particular sacred Earth place is where my mother has chosen to make her presence known to me this year. “Be still daughter”, she says. “Bear witness to the women rising.” My mother was the victim of domestic violence. She has called me to Grandmother Madrone to impart wisdom. She is making it clear to me that although her life was short, and sad, that she created me, who lives on. Although she could not, by example, show me the home of an honored woman, she has led me to the very lessons needed to realize that women are sacred. She insists that I would create the balanced home of a woman well-loved. She marvels at my fastidiousness to heal the lineage of the women of my family and bloodline. She bows in reverence to the challenges of my path. My mother started communicating with me in earnest last year when she nudged me to go to the shrine of Lady Guadalupe in Mexico City. 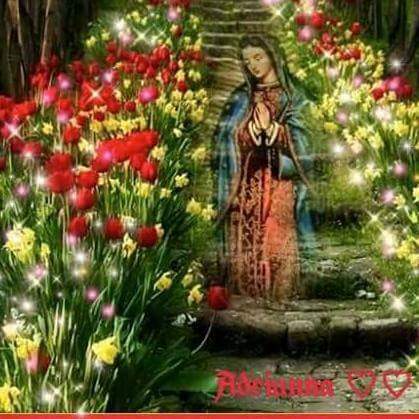 This annual day of reverence, 12-12, is the Feast of Lady Guadalupe, it is also my mothers birthday. 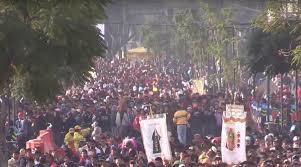 Serendipitously, I embarked on a shamanic training with Sergio Magana, Ocecoyotl in which I found myself in a moving crowd of nine million Catholic devotees and indigenous pilgrims. Sergio’s students, honoring the old religious protocol of the Aztec, walked along with clear intent as we performed various prayers & movements to heal our blood lines and to release our underworlds. Our six-hour walk will eventually lead us to the mound of Tonatizin Tlalli Coatlicue, the original Aztec Mother Goddess, Mother Earth herself, who the Spanish conquerors displaced hundreds of years prior with the current Basilica of Lady Guadalupe. I was slightly amused by the perfect crossroads of Christianity and Shamanism, where my mother and I could actually, peacefully, meet. On this annual religious pilgrimage, I was able to light a candle requesting the Lady Guadalupe to assist me in my healing desires for my family, I was able to kneel on the earth offering deep gratitude to the original Earth Mother who provides all, and I was able to find an inner peace with my own Mother who had departed twenty-eight years prior from bone cancer. 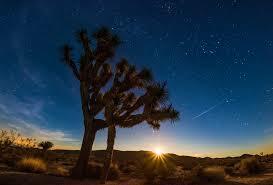 Shortly after her death, I was called to Joshua Tree, California for my first plant medicine initiation. I lay under the desert night sky, riddled with more stars than I had ever seen, aware that some of those stars were speaking to me; they were my ancestors voices whispering. I was able to feel my mother safely in the Mictlans, the land of the dead. Throughout that night, the Sky World Ancestors kept urging me to remember. Remember. I have often been haunted by that particular spiritual quest as I never quite understood what message was being transmitted. Nor did I know, it would be years later, in a pine forest, at the base of a madrone tree, after many life lessons, marriage, motherhood, loss of love, divorce, and maturity, far from the land of my birth, at the dawn of the 5th world, I’d finally realize the simple and potent message being imparted on that starry night: Remember who you are! YOU are a Holy Being. You are the center of this universe. You are the creative life force. You are the beginning and the end. It is in your arms that all is well. YOU are the Holy Grail. Front and center. To be honored, respected, heard and seen. “Violating a woman is a violation against God, a sin against yourself; karmic suicide.” (Gina Loring) Any world, family unit, work environment or religious system that does not operate with this foundational belief is doomed to fail. Woman, Mother, Sister, Daughter, Warrior. Remember! It took years upon years of untangling, unraveling and re-patterning to believe these simple truths. It has taken centuries to reach this juncture in history, the dismantling of the patriarchy, the empowered woman, the supportive male. It is time. At Grandmother Madrone, high up on an North American earth mound, I carry a candle to the Lady Guadalupe to thank her for cradling me in her Mexican Basilica while hearing my prayers. Here, on this mountaintop, I bow down in prayerful thanksgiving to Tonantzin, Mother Earth, for everything. Everything. Here, in Ashland, Oregon, I feel my Belizean mother’s full presence as my main ancestral guide. The Original Sky World Ancestor. It is my deceased mother, after all, who has dedicated her bones to the earth to offer me life and it is she who has called me to this rejuvenation tree to connect with my stars, and to make good medicine. The Grandmothers Speak is a rejuvenation Earth essence which heals mother/daughter wounds and the female spirit $12.00. An Altar for the Ancestors!